The sun was far from risen when our alarms went off, it was just about 4 am and another early morning start for our exploring gang. Andrew, the owner of Hot Air Balloon Cairns and our personal guide for the day, was waiting outside our hotel to take us to our next adventure. It was pitch black as we came out from our rooms and the few streetlights ended up blinding us more than they helped us. Our heads and eyes were barely awake, some of us had just gone to sleep when our alarms woke us up. Andrew was standing next to his large white van with a big grin on his face as we fumbled our way to the car. He was holding a tray off freshly brewed coffees in his hand and quickly supplied all of us with one before jumping in the car rushing us in. We were already late to catch the first sun rays of the day. 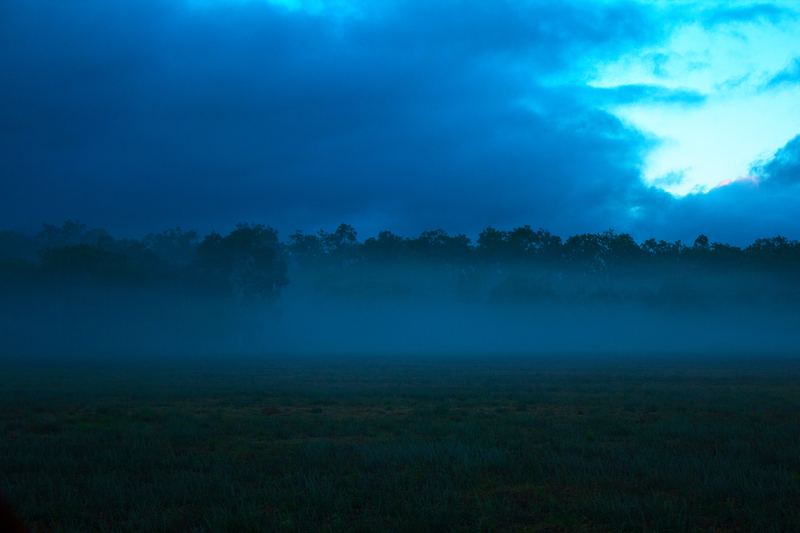 As we were driving further and further out from the city of Cairns the stars on the sky appeared brighter, and when we arrived to the big field surrounded only by forest, the sky was filled of little twinkles reminding us that we’re not the center of the universe. From afar we could spot the hot air balloons getting filled with hot air, some were ready for take off and some were resting on the ground as fire was spraying inside of them, illuminating their colors of orange and red in front of the night sky. As we were walking closer the air got warmer because of the flames and standing next to the balloons we realized how massive they actually are. Curiously we walked around, taking photographs of everything we could find, whilst Andrew was telling us stories and provided us with facts. To fill a balloon with hot air you need a inflator fan and a gas burner which fires up flames into the envelope of the balloon and fills it with hot air. We stayed on a safe distance from the skirt of the balloon and the gas burner since it was firing randomly and we preferred to keep our hair and eyelashes intact. When Andrew noticed our curiosity and fascination of the whole process he shut off the gas burner for a minute and told us all to jump inside the balloon where it was situated still on the ground. And when I say inside of the balloon I don’t mean inside of the basket, but inside of the Envelope, as it’s so cleverly named. We were inside the hot air balloons head (!!). As we were standing in the middle of the red balloon, on a fair distance from the burner, Andrew asked us if we were ready for the fire. I think we all were quite surprised and a bit insecure of how to answer this question but we decided to trust this man with our lives… and our eyelashes and decided on a “Hell yes!… We think….!”. The flames came racing towards us as he fired the gas burner and we could feel the heat on our chilly morning cheeks as it got close. 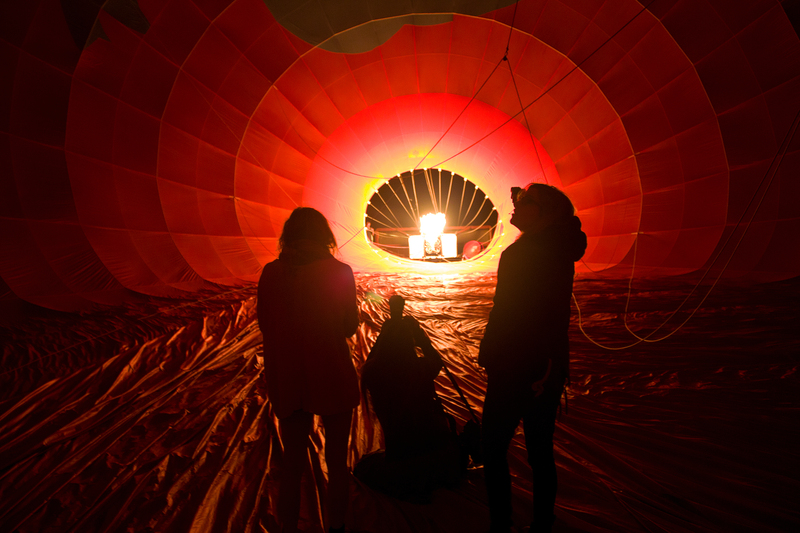 The whole balloon seemed to light up, with us inside it absolutely mesmerized by the beauty of this man made creation. We all got out, eyelashes and hair unharmed, unable to speak a word out of pure joy. This was an experience I didn’t even know was on my bucket list. 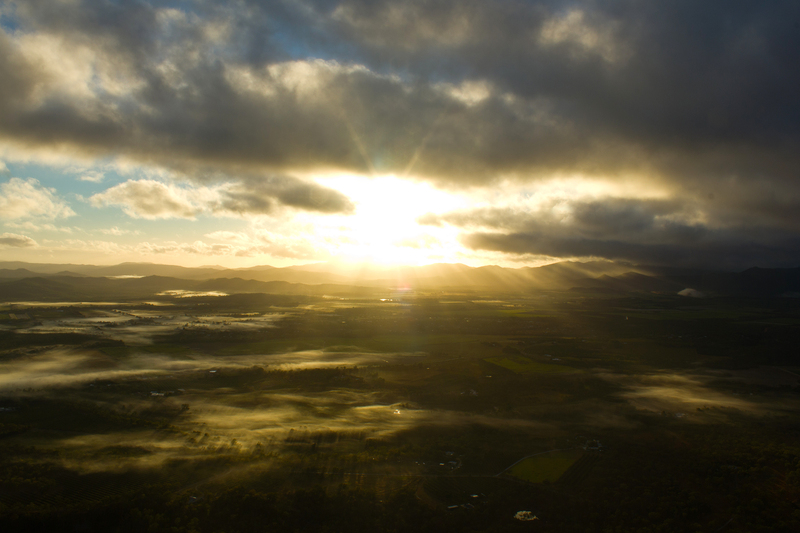 Our captain Johan shipped us all into the basket of our balloon and we were told to hold on to its edges and bend our knees as we lifted into the sunrise overlooking Atherton Tablelands. The sun had not yet risen over the few clouds in the sky so we had the pleasure of viewing as it did. Seeing the sun rise over the horizon this morning, as we were gliding soundlessly across the sky, is a memory that I will always treasure. There’s nothing as peaceful as a sunrise and few words are able to completely describe how it feels to spend it 2,000 feet up floating around in the sky :)! After bumping down onto the ground again we all worked together to fit the giant balloon back into its bag. We were taught how to roll it up and fold it to make it fit and then got on the back of the truck catching a sneaky ride back to our car for breakfast at Holloways Beach. For giving us this experience and for making it such a special memory. When a hot air balloon lifts it is filled with about 450,000 cubic feet of air, representing about 450,000 basketballs. 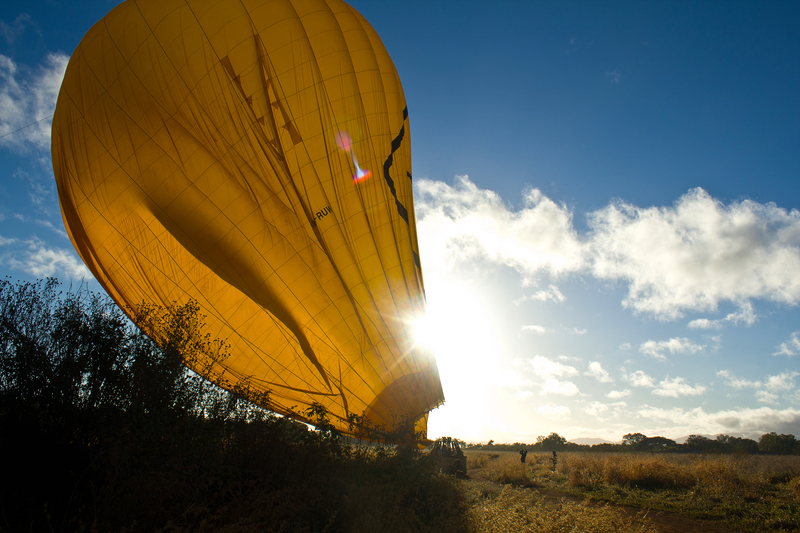 Hot air balloons can lift because the hot air inside the envelope has a lower density than the colder air outside. Hot air balloons were carrying people through the air almost a decade before the Wright brothers, who invented the first airplane, were born. 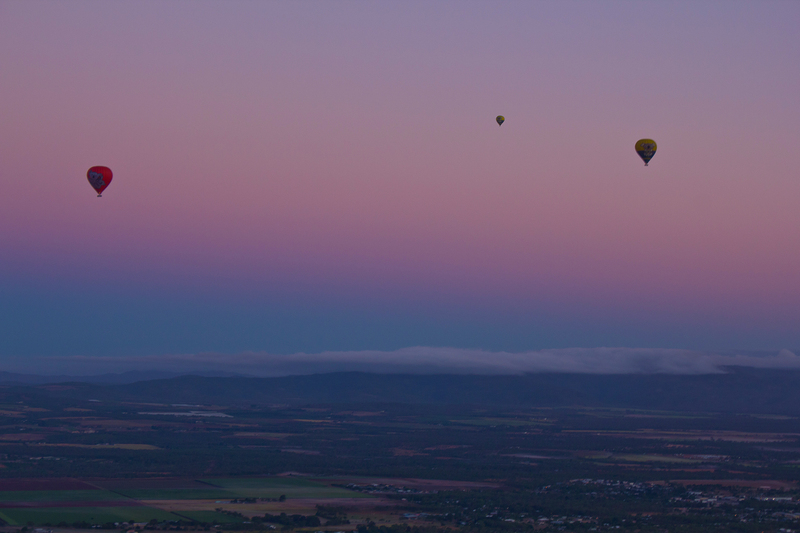 A rooster, a sheep and a duck were the first passengers going in a hot air balloon. They were luckily unharmed, opposed to the first pilot who died in an air balloon explosion 2 years after the debut. Have you experienced something that was not on your bucket list but ended up being an incredible experience? Tell me about it in the comments! 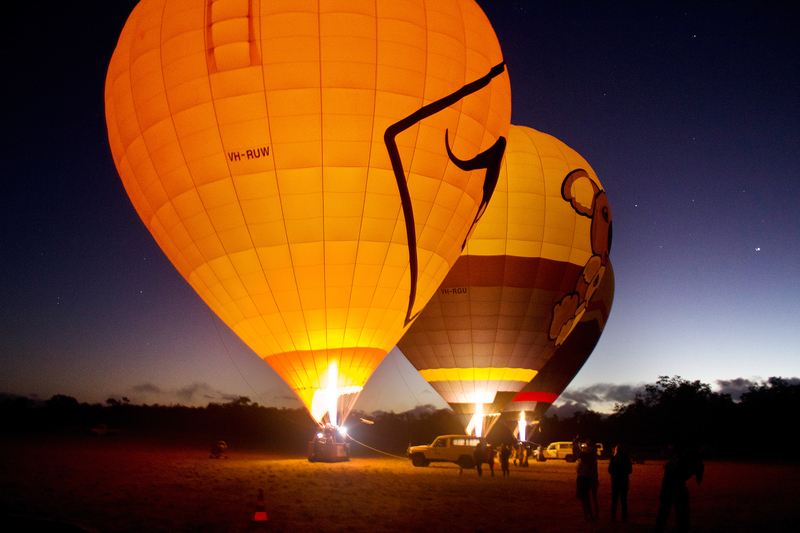 Tags: australia, Cairns, experience oz, hot air balloon cairns, travel, wanderlust. Bookmark the permalink. Previous post ← 10 reasons to move to Sydney. What an incredibly special experience with what must’ve been a breathtaking view! I’ve never been on a hot air balloon but I always think it sounds so magicaland romantic! I’ve been once in a hot air balloon myself and won’t ever forget the experience. Your photos are beautiful! I love the one with the balloons set against that gorgeous pink sky! It’s such a wonderful experience isn’t it?! So peaceful and dramatic at the same time. Just incredible :D.
Where did you go for your ride? It was a incredible experience that I hope you’ll get to experience Mabel! Thanks for your compliments lovely! Enjoyed your post, beautifully shared, what a great experience. I did not realise they did balloons from Cairns, thought it would be unstable their. It was an amazing experience and yes they do! You should head there and try it out, maybe you’ll even spot some beautiful birds :D.
That looks absolutely stunning. A real one of a kind experience!